Benang Stukel waterfall location About 25 kilometers to the east of Mataram these two beautiful waterfalls are hidden in the rice fields and the hills at the foot of the Rinjani volcano. From Senggigi , Mataram it takes about 1.5 hours driving to the waterfalls. After half an hour driving (from Senggigi) you will enter the non-touristic part of Lombok. When you have passed the city of Mataram and the crowded Cakranegara we can show you will see more and more of Lombok’s beautiful nature. When we go off the main road the road gets worse, but the view gets better. The last part of the trip is on an old dirt road, in raining season not always possoble to drive on this road so you have to walk a little longer. The waterfalls are situated in a tropical jungle with lots of different trees and plants. From the entry of the park about 10 minutes walking to the first waterfall (Benang Stokel) and another 30 minutes walking to the Benang Klambu waterfall. 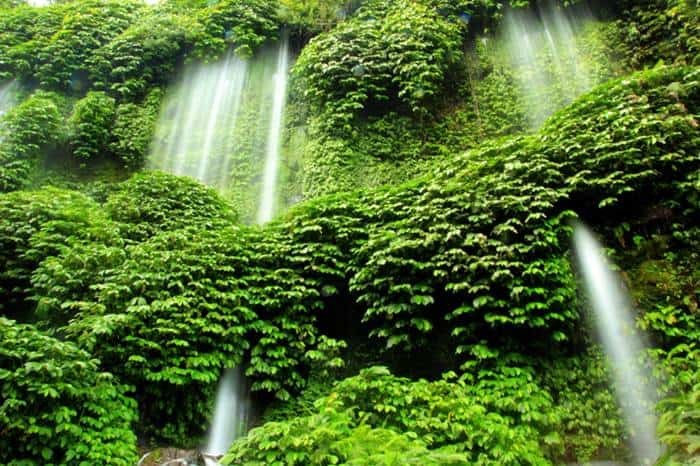 The waterfalls are easy to reach (no heavy climbing like the Rinjani and the Sedangile waterfalls) and can be booked as a day trip and also as an activity on the way to the Rinjani. For the second and most beautiful waterfall you also have to overcome some small hills and walk through a banana plantation. – English Speaking tour guide. – Soft drink served on car. – Entrance fee and Donation. – Tour and activities as mentioned on tour packages. – Personal expenses (Laundry, Tel, alcohoic drink, etc). – Local guide at tourism object. – Booking should made minimum one day before departure. – Price quote per person at minimum participant of two travelling together. – Price can be change until reservation are confirmed. – Price are inclusive of 21% tax and service charge. – The price valid for international market. Copyright © 2012-2018 Em Adventure. All Rights Reserved.